The free entertainment! I admit I was very upset when my husband found out he had to go to work in what ended up being a blizzard. And no, I did not want to go out in the snow to shovel 5 inches off my driveway only to have another 5 inches fall. And of course I could forgo the 15 to 20 minute snow readiness prep. But honestly there is nothing more fun to a kid than snow. They love this fluffy white stuff. 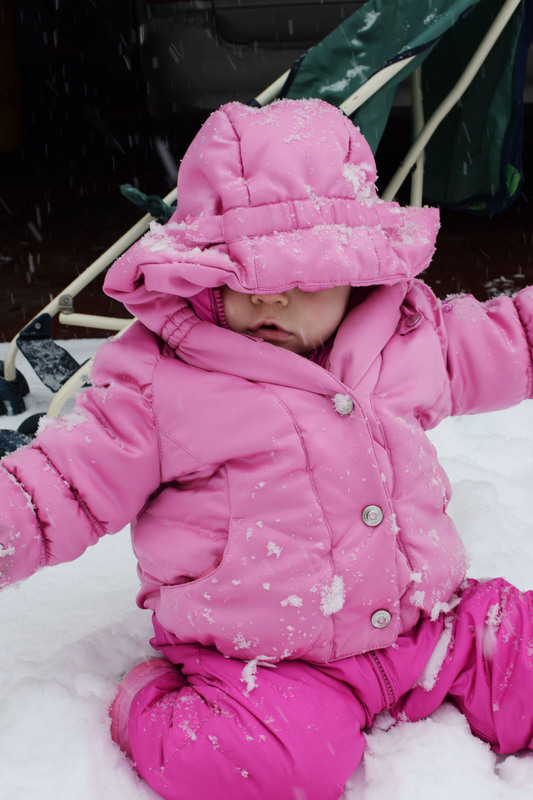 Destructo spent the entire time fall on her face in the snow yelling “It doesn’t hurt!”. We never get the right kind of snow for a snowman but I think after the most recent snowfall we can build one from pure quantity. Tiny on the other hand was less than thrilled. Apparently it is very difficult to walk in snow pant, snow boots, a fully snow jacket, and 3 layers of clothes. I tried putting her on the sled and in the stroller but she wasn’t really happy. I was able to shovel the driveway so Hubs could make it into back from work in his 1992 Plymouth Colt! All told we are going to get more then 10 inches of snow! By far not the most snow I have endured but the most either of the girls have ever seen. It was work but it was so much fun. We even walked the neighborhood. It was weird seeing the neighborhood that quiet. I think that is my favorite part of snow, it makes everything new and still. People stay inside and the birds stop singing when it snows. Don’t get me wrong, I love the hustle and bustle of Spring and Summer, but there is a unique calm that comes over the world when it snows. My “winter calm” may have been interrupted by my preschooler doing her best Olaf impersonation screaming “I can’t feel my legs! I can’t feel my legs!” but it is still there. Take a step outside and just sit in the quiet for a moment. I am very tired of snow and even more ready for spring, but God grant me a blessing of seeing the stillness in the storm during this blizzard. It was beautiful. So enjoy it, play in it, eat it, build with it, make art with it! Do more than watch it and complain about it. And of course, Stay Warm!